For the longest time, my bedroom was my favorite space of the house. It was the place I retreated to when the world became just too much. I filled it with our favorite things and little luxuries. I never worried about having to show it off or keep it prepared for company. It was a place of comfort for my husband and me. Well, mostly for me. My cozy bedroom space, where I had once curled up with a good book or indulged in an afternoon nap became the very place I suffered through sleepless nights and stress-induced anxiety. A place where I isolated myself from the ones I loved most. My bedroom was no longer a haven of calm and rest—instead it reminded me just how much life had spun out of control. The emotional and physical toll of this season was hard enough, but losing the comfort of my go-to space was an added heartache. Thankfully, my family, friends, and Savior never left my side. As I emerged from the fog and began to see in color once again, a desire to redeem and restore my bedroom sprang up within me. It seemed almost as if transforming the space could transform its cherished history. With a limited budget but big, beautiful dreams, creativity was key. The result was a new chapter for both my bedroom and my life. Everyone needs a space that feels like home. 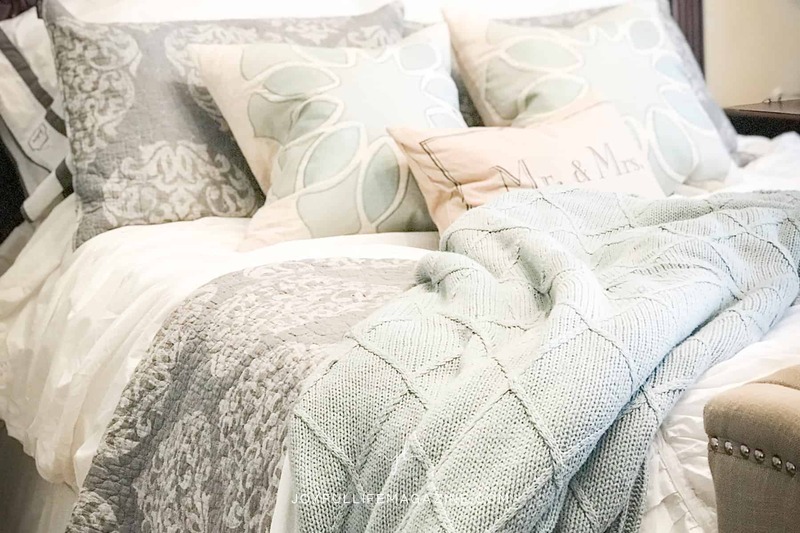 Here are some tips to help you bring joy and peace to your own bedroom sanctuary. If you’ve never defined your style, now is the time to start! Begin with the items that are in your closet. You tend to buy clothes that appeal to your sense of style. Do you have several pieces of clothing in a particular color? Are your clothes monochromatic or do you have a rainbow? Do you prefer classic or trendy looks? Your closet provides plenty of insight as you seek to create the bedroom of your dreams. Once you identify your style, furniture and accessories will jump out at you wherever you go. Create an inspiration board on Pinterest and pin anything that catches your eye. Pro Tip: Don’t limit yourself to photos of bedrooms. You are creating a visual collage of things you love, so it doesn’t matter if the photo shows a kitchen or a bathroom. If you love something about the photo, pin it there. Low-budget home design is easier with more than one pair of eyes watching for sales, special items, and thrift store finds. Share your inspiration board with a friend and team up. Communicating your vision to another person also helps clarify it in your own mind. Don’t rush yourself! Enjoy the process and incorporate changes as you go. You may be tempted to transform the room all at once, but the goal is to choose only things that truly bring you joy. That takes time and a long view, but the end result will be worth it. You may be tempted to transform the room all at once, but the goal is to choose only things that truly bring you joy. You may be amazed how easily you can repurpose items from around your house. And since they’re in your home, you probably already love them! Paint older furniture. Reframe photos. Reimagine. Move things around. Try it out and see how it looks. Most people stress about the color of their walls and ignore the impact that textures can have on the overall feel of a room. Think fabrics, baskets, and even nature. Something as simple as a houseplant sitting on a chair can fill an awkward space and tie it all together. Extra large area rug, perpendicular under the bed. You don’t need hardwood for an area rug. Go ahead and place it right on top of carpet. Experiment with layers, too. A rawhide rug over an area rug over builder-grade carpet can make a big statement. Swap out dresser and nightstand hardware for instant bling. A cracked antique mirror makes the space feel larger and offers a touch of character. Double-rod window hardware with an outer layer of fluffy white drapes and an inner layer of sheer patterned panels. Hang window hardware well above the window and let your panels spill onto the floor for a romantic look. Outdoor potting table repurposed as a night stand on one side of the bed. Mismatched furniture that surprises and catches the eye. NEW PRODUCT! Spring floral watercolor greeting cards!